Ruju, A., Ibba, A., Porta, M., Buosi, C., Passarella, M., De Muro, S. (in press). The role of hydrodynamic forcing, sediment transport processes and bottom substratum in the shoreward development of Posidonia oceanica meadow. Estuarine, Coastal and Shelf Science, in press. De Muro, S.; Tecchiato, S., Buosi, C., Porta, M., Bachis, M., and Ibba, A. (2018). 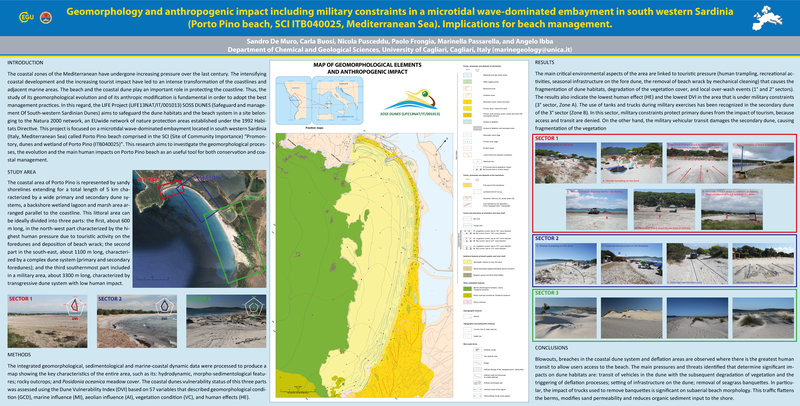 Geomorphology, Sedimentology, Benthic Habitat Mapping as Tool For Supporting Coastal Management: Comparison Between Australian And Mediterranean Beach Systems. In: Shim, J.-S.; Chun, I., and Lim, H.-S. (eds. ), Proceedings from the International Coastal Symposium (ICS) 2018 (Busan, Republic of Korea). Journal of Coastal Research, Special Issue No. 85, pp. 1–5. Coconut Creek (Florida), ISSN 0749-0208. De Muro, S., Ruju, A., Buosi, C., Porta, M., Passarella, M., Ibba, A. (2017). Interaction between Posidonia oceanica meadows upper limit and hydrodynamics of four Mediterranean beaches. Geophysical Research Abstracts Vol. 19, EGU2017-18774 (Vienna, Austria).